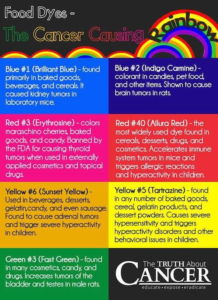 Food Dyes: Good for Dying Foods and ‘Dieing’ You! Why are We Eating Them? Red 40, Yellow 5, and Yellow 6, are contaminated with known carcinogens and cause genetic damage. Red 3, has been recognized for years by FDA as a carcinogen, yet is still in the food supply. It gets worse. “These synthetic chemicals do absolutely nothing to improve the nutritional quality or safety of foods, but trigger behavior problems in children and, possibly, cancer in anybody,” said CSPI executive director Michael F. Jacobson, co-author of the 58-page report, “Food Dyes: A Rainbow of Risks.” “The Food and Drug Administration should ban dyes, which would force industry to color foods with real food ingredients, not toxic petrochemicals. The links to cancer for these unnecessary, toxic chemicals are well established and, horrifyingly, not recent. By 1985, FDA’s acting commissioner said Red 3, one of the lesser-used dyes, “has clearly been shown to induce cancer” and was “of greatest public health concern.” But Secretary of Agriculture John R. Block pressured the Department of Health and Human Services not to ban Red 3, and prevailed. This was – and continues to be – in clear violation of the Delaney Amendment which forbids the use of in foods of cancer-causing color additives. Despite the science – and despite Delaney – each year about 200,000 pounds of Red 3 contaminate things like Betty Crocker’s Fruit Roll-Ups and ConAgra’s Kid Cuisine frozen meals. Since 1985 more than five million pounds of this dye alone have been used. It gets worse. Animal lab tests of Blue 1, Blue 2, Green 3, Red 40, Yellow 5, and Yellow 6 showed signs of causing cancer or suffered from serious flaws. Yellow 5 also caused mutations, which suggests that it can cause cancer, in six of 11 tests. Further, FDA’s own tests show that the three most-widely used dyes, Red 40, Yellow 5, and Yellow 6, are tainted with low levels of cancer-causing compounds, including benzidine and 4-aminobiphenyl in Yellow 5. While “low levels” sounds somewhat reassuring, in the colon the levels actually could be far higher. As far back as the 1990s the FDA and Health Canada both found a hundred times as much benzidine in a bound form that is released in the colon. That chemical form is found in the colon but is not detected in the routine tests of purity conducted by the FDA. 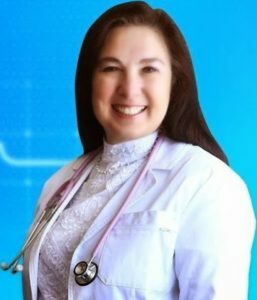 Numerous studies show that artificial colors change the behavior of susceptible people, especially children, in negative ways interfering with attention, concentration, self-control and stimulating impulsive, inattentive behaviors including violence. While Dr. Huff feels that this lack is disappointing, I have another word for it: criminal. But this criminal negligence and conflict of interest has a simple cure that is in your hands for yourself and your children: NEVER, NEVER consume anything with these dangerous and unnecessary chemicals. Organic foods are forbidden from including them. More expensive? Yes. How expensive is cancer?